Jack lived at 4105 Sommers Avenue in Drexel Hill. He died in 1975. Jack went to St. Andrew's with me, too. He had a voice like Froggie from the Little Rascals when we were very young. He was a good guy. From Douglas Rider: I met Jack in elementary school and became close friends at DHJH. We used to try to look like the Beatles at that time. Jack lived on Sommers Ave. We used to hang out, smoke cigarettes and chase girls. I remember we played in the talent show at Drexel Hill Jr. High, I played drums, Jack played guitar. Unfortunately we had a falling out and lost touch. After ninth grade I moved to West Chester PA and never saw Jack again. Often I look back to those days and the friends I grew up with in elementary and jr. high school 1958-1967. I saw Jack’s picture while looking through classmate profiles and was shocked to see he was gone. I am saddened by his lose. Does anyone know the actual date and year of Jackie's death. My recolection is he died earlier than 1975, maybe while we were still in high school. Any thoughts? Hi Jim - Like you, I went to St Andrew's with Jack. According to our records, he did graduate with us in 1970. All I could find was a grave marker and SS record - born April 2, 1952, and died August 1975. Thanks, Patte. I always liked Jackie going thru St. Andrew's. Didn't see much of him in high school. I was stationed in Germany when he died, but somehow thought it happened earlier. Do you know what he died of or where it happened? 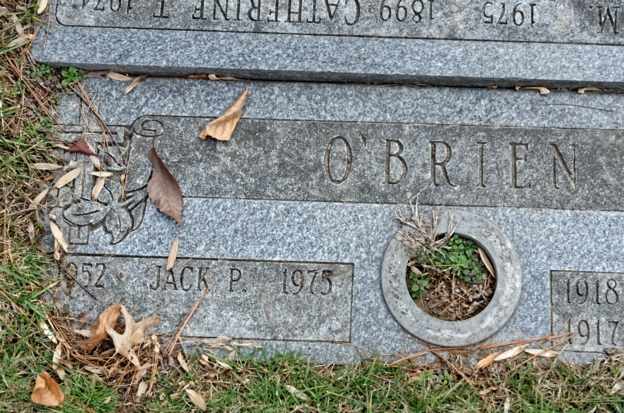 I too knew Jack O'Brien, He was also very good friends with Brian Kerl. I believe but not certain that Jack was in a car accident and his daughter might have been injured in the accident.as well. Hi - I just confirmed with a reliable source that Jack did die in 1975 in a car accident.